Those versed in country music knowledge are very aware that the Everly Brothers are in the Country Music Hall of Fame. Those even more versed in country knowledge know that the songwriting pairing of Felice and Boudleaux Bryant who wrote many of the Everly Brothers’ biggest hits are also in the Country Music Hall of Fame. And those who really know their stuff when it comes to country music don’t need to be told why a band mostly known for pop and folk rock earned such a distinction. They know the Everly Brothers were always more country than anything else, and they know why. There is arguably nothing more country than the conjoining of sibling harmonies brought to life in music. In the most primitive of times and places in early America when even guitars and fiddles and the strings to play them were tough to come by, brother and sister, or brother and brother could still stand out on the back porch or in front of the hearth, and in perfect pitch and synchronous beauty, entertain the family in the evening when the day’s work was done with an intimacy of sound only two people living under the same roof can replicate. And they often did, unaided by accompaniment, honing both the ears and the lungs in ways that made you appreciate the delicacy of the human voice, and the importance of not just singing but listening, anticipating, breathing, until two voices became one. The Everly Brothers embraced that very primeval approach, even when singing about teenage love, and made a sound unparalleled in popular music that only two siblings can. 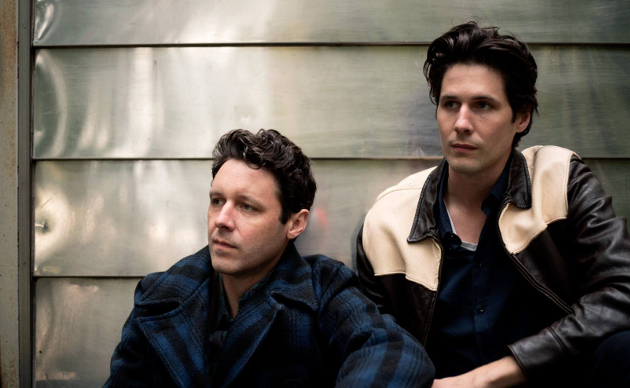 That same charm and magic is at the heart of the appeal of Minneapolis, Minnesota’s The Cactus Blossoms, made of brothers Page Burkum and Jack Torrey. Though it’s probably not completely fair to compare the Everly Brothers to the Cactus Blossoms in direct parallel, it’s hard not to. The Cactus Blossoms embellish their brother harmonies with instrumentation that is just as much classic pop and folk as it is country, just like the Everly Brothers did. The “less is more” approach is employed in a similar fashion, with the voices and the words put out front. And both will give you chills and awaken a nostalgia from this primitive and timeless approach to music making, allowing simple compositions to tingle the skin like orchestral movements. 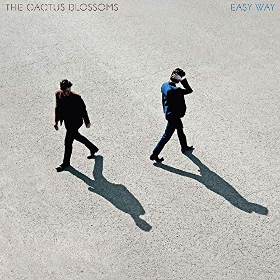 On their new album Easy Way, The Cactus Blossoms travel a bit farther afield in how they arrange and add instrumentation to their songs. Self-produced, they also enjoyed the aid of Dan Auerbach from The Black Keys who co-wrote two tracks, Michael Lewis of Bon Iver and Andrew Bird on saxophone, and Joel Paterson of Devil in a Woodpile on pedal steel. Compared to their previous record You’re Dreaming, the new album is a bit more of a progressive as opposed to rootsy. But it’s still the harmonies and storytelling that are the focal point of the music. Some country and folk fans may be a little disappointed in this more contemporary approach, favoring the duo playing acoustic and singing into one microphone, which still happens in moments. But these moments are also bisected by electric guitar riffs and flourishes, drums and ample hand percussion, and bass back end, even if compared to most projects, Easy Way is still tastefully sparse and fetchingly classic. The beatnik percussion of “Got a Lotta Love” may take a little warming to. The jangly guitar of “Please Don’t Call Me Crazy” may be jarring to some. But when they hit the chorus, it’s hard to not be sent soaring on the high of perfectly-blended brother harmonies, even if the same effect could have been enacted acoustically. The Cactus Blossoms move the timeline slightly ahead on Easy Way, from the early folk revival to more of a mod approach. It may ruffle some feathers, but it works for them. The songwriting, just like the music, continues to stay simple, but erudite nonetheless, approaching themes of loneliness and love that are universal in their resonance. “Downtown” addresses the social theme of wealth inequality, but not in an overly preachy way. “Boomerang” is both heartbreaking and hopeful, about a love that’s left, but one the protagonist is certain will return. Easy Way bogs down a little near the end, not including the same melodic sensibility as the beginning, but ultimately the album delivers an enjoyable listen overall. Awakening the power of sibling harmonies in a way that is evergreen in country music, but slightly new for The Cactus Blossoms is at the heart of Easy Way, and it’s hard to not enjoy, especially with extended and patient consideration. For as good as their two recent albums are, head to YouTube and listen to their versions of “San Antonio Rose” and “Haul Off And Love Me One More Time.” Sheer brilliance.. In the spirit of the article I’m making an unrelated comment on, I’ll finish by saying that Desperado is a JAM. Never heard of them before this article and the 2 posted videos. These guys are good. Really good. Thanks! Check out their first album! Its rather beautiful. Its funny you did the review today because I listened to them for the first time yesterday. My opinion is the are okay but a little sleepy for me. I respect what they do. Just not enough energy for me. The last few songs of the record dragged for me. I still like it, but can understand if folks find it sleepy. Thanks for this review. I enjoyed what I heard and will listen more. These reviews don’t get as much attention as some of the other articles you write here, but they are probably the most important thing you do…exposing your readers to really good music they wouldn’t otherwise ever hear. Maybe I should send this question in an email. Since it is a bit unrelated. But have you ever consider writing a review of any album by the British sister trio “The Staves”? Yes, they are pop but not more than FAK are. They were opening for FAK during their last UK-show. And here is the (obvious superior) original from 1979. Thanks for the suggestion Kent, I’ll check it out. I liked ‘You’re Dreaming.’ I really liked it after seeing them in concert in 16. But, I haven’t really got into ‘Easy Way.’ Sometimes after you post a review like this, I go back and listen from a different perspective. I’ll try it again. I love the sound on “Got a lot of love” and “please don’t call me crazy” reminds me of Orbison, but it took me a few listens to get it. I take it as a good sign tho that this album will stay in the rotation longer. The only track off their last effort that is still in my library is Mississippi. This album seems to be an effort to establish their own sound, and I think they’ve made a positive step in that direction. Their debut was great, but it relied too much on nostalgia. This one makes them relevant. This album to me like it was produced 10 years after their debut album, yet decades ago. The first Everly Brothers 1950s, this album more late sixties feel. They are great, but I do prefer their first album, and wish they would just take their initial style and up the energy. None the less, just an opinion in the end. Very much a throw back to the late 50s/early 60s type of music that was on Mum’s RCA Victor record player when I was wee. Thanks, I’ve learned about so much good music from this site! I’d like to hear what would happen if these guys wrote songs with Nick Lowe. The second tune sure sounds like it could’ve been left off a Rockpile record. A real duo here. Not the made-up kind. (i.e. B&D or Sugarland). I’m happy with this album. I was mildly concerned after hearing Please Don’t Call Me Crazy that they might be heading too much away from the style they established on You’re Dreaming, but I quite like that song now after hearing it within the context of the whole album. Thanks for this post. I loved “Desperado”. I feel like this band is making the music they were meant to make and that can be tough to do in this business. It’s art, and it’s beautiful. I love it. “If you can’t trust me, walk right past me.” What a line!